Happy Halloween! 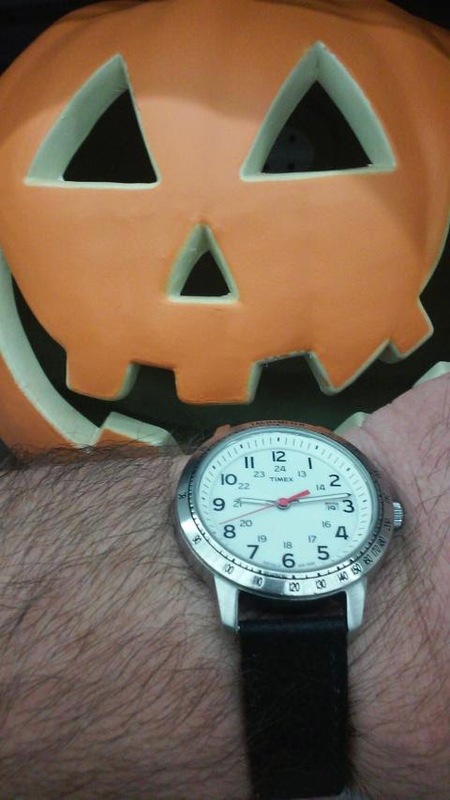 If you are looking for the perfect watch for escorting trick-or-treaters, you might want to choose a Timex with Indiglo dial lighting. 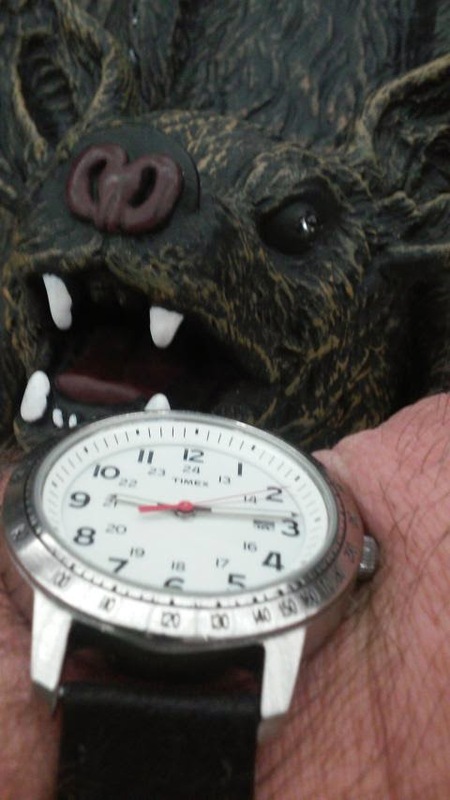 I find that the Timex Weekender is the kind of watch value that you can really sink your fangs into! Every year, the HGTV television network generates a lot of excitement by holding a drawing to give away what they call the HGTV Dream House. This year they are giving away a condominium in Atlanta that they are calling the HGTV Urban Oasis. It's an exciting contest even though I could not even afford the tax bill if I were to win. That condo is the kind of home most people dream about for a lifetime. It makes me wonder: what kind of watch would I wear if money were no object? A year or two ago, I would have gone for something by Bell & Ross. But now, I'd probably up my game and go for something by Ulysse-Nardin or Breitling. But, for running around in a crowded city, I'd still have a Timex for daily wear. If money were no object, which watch brand would you wear? The Major League Baseball World Series kicks off in just two days. This year it's the San Francisco Giants against the Kansas City Royals. Game 1 will be held in Kansas City. If you are a San Francisco Giants fan, you may want to show your team some love by wearing a San Francisco Giants watch . Gametime offers many sports team watches. 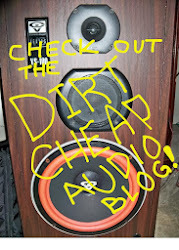 While they are relatively inexpensive, I've found that they hold up fairly well. To me, the Game Time MLB Vintage Series Team watch looks the best. The dial simply looks like it does a good job of upholding the traditions of baseball. The Giants won the 2010 World Series. Can they do it again? Next, we'll find out how Kansas City fans can add a Royals touch to their wrists. This week I saw a spectacular watch at work. It was a Michael Kors Dylan Mk8303 watch. It sports an oversized dark blue dial protected by a very solid looking stainless steel case. As a chronograph, it has a three sub-dials to display 60 seconds, 30 minutes, and 24 hours of elapsed time. The band is made of rubber or silicone and is also a dark blue. 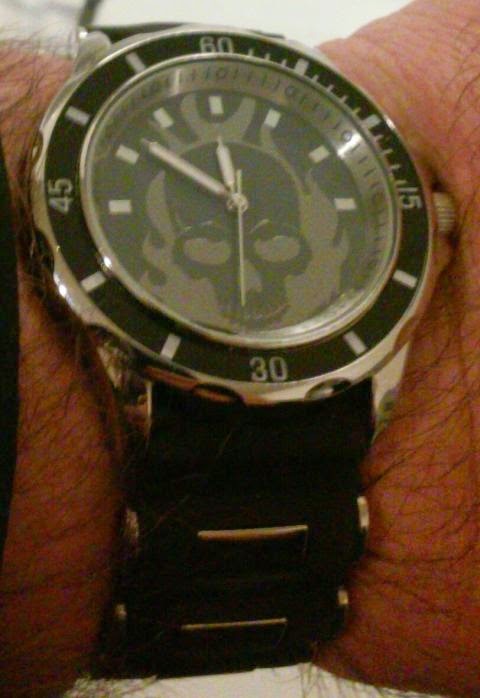 While it's difficult to review any watch from afar, my co-worker was quite pleased with his new watch. He particularly liked they way that the dark blue dial and band match any pair of blue jeans he cared to wear. It's a watch that definitely gets noticed. Very cool. The Michael Kors Dylan watch comes in multiple colors on Amazon so you'll likely find a style in your favorite color. Are you looking for an unusual watch to add to your collection? You might try adding a one-handed 24-hour watch. Watches like the UNO 24, One-Hand Men's Watch by Botta-Design encourage a different sense of time. Instead of measuring time down to the very minute, a 24-hour watch tangibly shows the progress of your day. You see your entire day in a single glance. You know how many hours are left in your day. Watches like this encourage the wearer to make the most of his day. The UNO 24 has a 40 millimeter case that is a slim 7.5 millimeters thick. It comes in a decidedly masculine black and grey color scheme. It is powered by a Swiss Quartz movement and has a 20-millimeter wide leather strap. For a brighter design scheme, the UNO 24 NEO by Botta Design has similar dimensions and features with a brighter wide dial. You can read more about these watches on Amazon. These one-handed watch designs are also great for retirees. They provide minutes in broad 10 minute increments. Relax! Who has to be somewhere at 12:37 p.m. on the dot anyway?